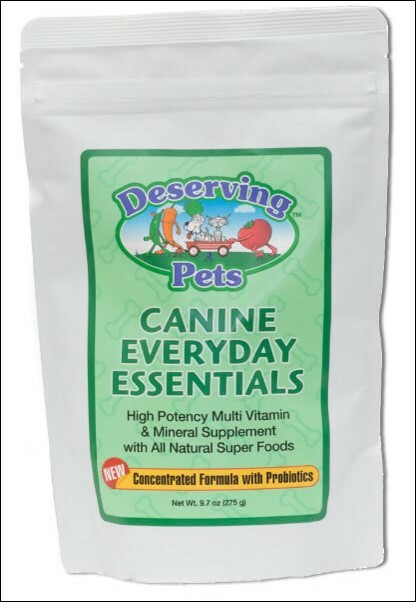 Deserving Pets Canine Everyday Essentials liver-flavored supplement is a human-grade, high-quality formula made with highly bio-available ingredients in the USA. This is a COMPLETE formula - check the label to see what your dog gets every day in every dose. Canine Everyday Essentials has a full multi-mineral and multi-vitamin complement along with super-foods containing powerfully healing nutrients: Kale, Broccoli, Dandelion, Beets, Carrots, Apples, Cranberry, Blueberry, Alfalfa. It also contains both probiotics and prebiotics, the green foods that support the probiotic growth in the intestine. To protect the ingredients from decaying and oxidizing when they contact the air, the process of microencapsulation was used. Such oxidation happens all the time with vitamins and supplements if unprotected. Microencapsulation prevents the ingredients from degrading and, therefore, preserves their potency. It also makes the formula flavorful and delicious. How does microencapsulation work? The microencapsulation process involves wrapping the bioactive substances with a protective coating material that acts as a barrier, allowing the particles to be housed inside a miniscule sphere. Using this process is an assurance that the formula is well-conceived and that the formulators are dedicated to demanding quality and efficacy from their ingredients. Deserving Pets provides the best preventive supplement available on the market for your pet. Compare the guaranteed dose of vitamins/minerals and super foods with any other product on the market - you will be impressed. OTHER INGREDIENTS: Lactobacillus acidophilus, Palm Oil from Green Palm Sustainability Project and natural, human-grade flavoring of liver for dogs. One full scoop of powder sprinkled on a meal once a day for small, medium and large dogs. One half scoop of powder for toy and teacup sized dogs. Begin with half the recommended dose for the first week. Click the icon to read more about Deserving Pets supplements.